Yesterday, we mentioned that AutoWeek's Rory Carroll's Tesla Model S press car was trapped in his driveway due to a defective charger. It's noon right now and it's still there, stuck. 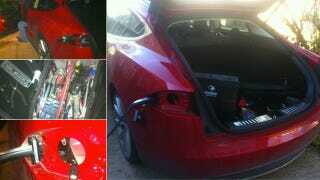 A Tesla tech was dispatched to Michigan yesterday, according to Carroll, and spent all night working to fix it. He had to order parts and is still in Carroll's driveway, trying to correct the stuck charger issue. The whole thing has been faithfully chronicled via Carroll's Twitter account and it provides an interesting insight into what it's like to own a brand new car with brand new technology. Because the number of cars Tesla has built is still relatively small, and because the technology is still so new, Tesla can apparently dispatch techs to come deal with odd problems that arise. In this case, the problem came after Carroll tried to disconnect the vehicle's charger to go for a drive. It wouldn't unlatch, meaning the car couldn't move, meaning he was effectively stuck. If he'd lived in San Francisco instead of Michigan he might have gotten quicker service, but Tesla did promptly fly someone from Minneapolis to his home last night. Here's the play-by-play below, via Carroll, including some interesting shots of the vehicle and what the tech carries. This bothers me. I'd like to be able to fix my own car (even if it's a job I wouldn't do), and being restricted/chastised by the technician sent to fix it bothers me. Welcome to the future. Given Tesla's current setup, being sent a strike-force team to fix your car is, in fact, quite cool, if not the only way they could realistically do it. There's a lot to be learned from these kinds of real-world tests that will probably benefit future owners, and if you're buying a Model S we'd expect you have another car in your stable... just make sure not to park the Tesla in front of it.